In a Nutshell: Businesses will do just about anything to boost productivity, but many don’t bother to improve the small details that can add up to significant gains in production. Multiple-monitor setups have become commonplace at corporate Windows workstations, and Actual Tools designs solutions to help workers move even faster. Users can bring hidden window controls up front with Actual Window Manager — and take advantage of customized controls — to enhance efficiency and to make desktop organization intuitive. 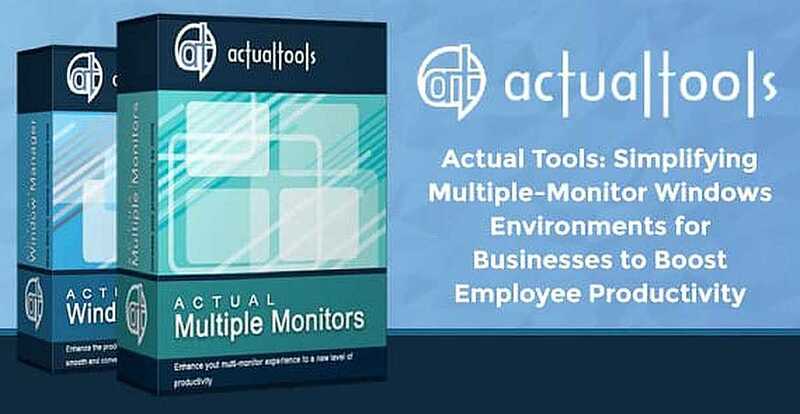 These tools reduce friction points in a multi-monitor environment and break down common barriers to productivity. Business owners go to great lengths to boost productivity. They buy high-level infrastructure that can analyze data at lightning speed. They create workplace applications and use business management software to streamline processes. They may even bring in motivational speakers to pump up employees. But one of the quickest ways businesses can boost production by 20-30% is relatively straightforward: providing employees with multiple monitors at their workstations. Employees who can pull up information on two screens can enter data, compare products, and visualize information faster than their single-screen counterparts. The multiple-monitor setup still needs an efficient operating system to maximize ROI. With Windows, in particular, users can add as many screens as they want, but much of the underlying functionality doesn’t transfer to all of the peripherals. Enter Actual Tools, a company that develops specialized solutions for multiple-monitor Windows environments — from individuals to enterprises. The company’s software brings the full OS functionality to multiple monitors and offers users a plethora of time-saving and organizational features. Actual Window Manager software makes it easy for users to not only enhance settings and features but also intuitively control all of the information on their screens. Users also have access to many of Windows’ hidden features upfront, saving workforces time previously spent searching menus to complete everyday tasks. Actual Tools products are a natural extension of the everyday computing experience because of how they were designed — with the user in mind. System functions often reside deep inside an operating system’s control panel, buried in a barrage of programs, bloatware, and rarely used subfolders. That is especially true for the window and multiple monitor controls on Windows workstations. Actual Tools was built to both make those functions readily available and enhance them. The company began with a moment of clarity around an organizational technique that Windows users desired — but one that took time-consuming configuration to execute. “That particular aha! moment was an ability to minimize any window into the notification area — or system tray — as easy as it could be minimized into Windows taskbar,” Jennifer said. From that minimization revelation came a suite of tools — Actual Window Manager — that would allow users to take even more control of their Windows workflow, one shortcut at a time. The Actual Window Manager suite brings together all nine of Actual Tools’ current products at an affordable price point for businesses. Many of the products included in Actual Window Manager are designed to enhance a specific Windows function. For instance, Actual Title Buttons gives users more robust title bar functionality — like ghosting a window or making it transparent — while Actual File Folders can help set up easy navigation to frequently used folders from menu buttons. Actual Multiple Monitors expands Windows functionality to all of a user’s peripherals, adding taskbars, system trays, and screensavers to connected monitors. Actual Tools continues to take that approach — releasing separate features as distinct products — for users who don’t need an entire suite. But combined, the products compose a formidable, and popular, suite. 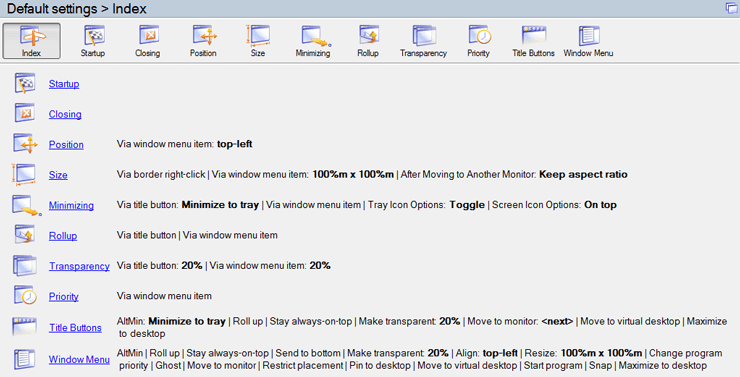 Actual Window Manager gives users complete control over their windows beyond just minimize, maximize, and close. Actual Tools provides features that Windows users have requested from Microsoft for years to no avail. These include group window dragging and sizing, login screen background control for secondary monitors, and the ability to group Explorer folder windows within tabbed containers — much like modern browsers do. Enhancing control over windows and extend operating system functionality to multiple monitors eliminates the tiny barriers to productivity that businesses don’t always take into account. But Actual Tools is there looking for ways to help Windows users simply break through. Businesses will try anything to get their workforce to shave seconds, minutes, and hours off the time it takes them to complete tasks. Adding another monitor to employee workstations is a proven way to drastically boost production. But new hardware can have an even more dramatic impact when paired with Actual Tools. The company’s products simplify many of the complex tasks workers repeat hundreds of times a day. And Actual Tools understands the pitfalls that daily Windows — and multiple-monitor — users encounter because it relies on them to help shape the products of the future. Actual Tools puts time-saving features front and center so users don’t have to rifle through complex Windows menus to find faster ways to get work done. In the process, the company is boosting productivity for workforces and increasing enterprise bottom lines — one click at a time.